Tom Dorrance (May 11, 1910 - June 11, 2003) based his methods on three things: feel, timing and balance. He listened to the horse to try and find out what the horse was trying to tell him. Then he could work out whether the horse understood or could find what was bothering him. From this informed standpoint, he got a feel for where the horse was coming from. 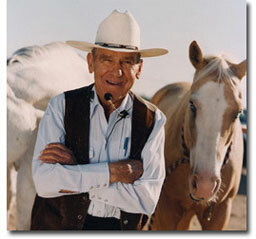 Throughout his life, Tom devoted a lot of thought to how to communicate with the horse. He studied their actions and reactions so that he could find the best way to present himself so that the horses would respond to what he was asking. It was his belief that true unity and willing communication come from within. The book True Unity was first published in 1987 and is still available from Amazon - see right hand column of this page.